Macular Degeneration is a condition that affects the retina of the eye and causes loss of central vision. It is the number one cause of vision loss and blindness in people over the age of 65. Other, less common forms are generally hereditary and can be found in people of any age. The most common form of MD is the dry, or atrophic, type. In this type, the macula, which is the center part of the retina responsible for sharp central vision and color perception, becomes the sight of deposits called drusen. These deposits cause the characteristic “spots” in a person’s central vision. There is usually a slow onset of symptoms in the dry form of MD and the disease continues to progress slowly, especially with appropriate dietary and medical attention. Generally, dry form MD does not lead to total blindness, although there can be a complete loss of the central vision. In the less common “wet” or exudative type of MD, tiny blood vessels begin to grow rapidly beneath the retina. These new blood vessels are very fragile and may break and leak fluids. This distorts the vision and causes scar tissue to form, creating blind spots. Wet macular degeneration can be very serious and can cause severe vision loss very quickly. It is important that any person experiencing a loss of central vision should have an eye examination by an eyecare professional immediately. 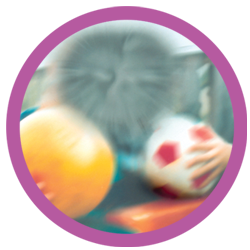 Dark, empty spaces in the central vision are the most commonly recognized symptoms of macular degeneration, but they are not the only symptoms. Some people with MD notice that straight lines in a landscape such as telephone poles or the sides of buildings appear wavy. Other symptoms are the blurring of areas of type on a page. Although there is no cure for macular degeneration, treatment options for people with the disease have come a long way in the past few years. Early laser treatments may help to slow the progress of the disease, especially in the case of wet MD. There is also a great deal of research into the benefits of for preventing or slowing the onset of dry MD. Injections of particular drugs into the eyes affected with “wet” macular degeneration are showing good results. Regular check-ups with your eye care professional and diagnostic tests can determine if, and to what degree, macular degeneration exists, and if laser or some other treatment may be effective. For more information on Macular Degeneration, please see our article on Vitamin therapy, or refer to the Macular Degeneration Foundation at www.macular.org. According to the National Eye Institute/National Institutes of Health, high levels of antioxidants and zinc significantly reduce the risk of advanced age-related macular degeneration (MD) and its associated vision loss. Published results of the Age Related Eye Disease Study as reported in the October 2001 issue of Archives of Ophthalmology indicate that people at high risk of developing advanced stages of MD (people who already have some MD in one or both eyes) lowered their risk of developing advanced MD by about 25% and reduced their risk of vision loss by 19% when treated with a high dose combination of vitamin C, vitamin E, beta-carotene and zinc. Please consult your physician and eye care practitioner before beginning vitamin therapy. You must consider your other health concerns before starting anything new. Also, know that vision that has been lost cannot be restored with this therapy. It is effective in slowing the progression of MD and reducing the effect of the disease only. Lutein was not included in the study in 2001, but current research indicates it is also beneficial to the health of the eyes.